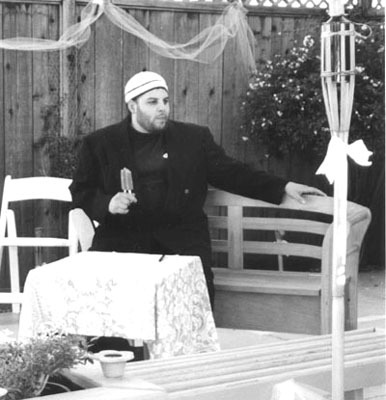 I registered the Zawaj.com domain name twelve years ago, in 1998, right around the time that you see me sitting there eating a Popsicle in the photo, ha ha. The name “Zawaj.com” was unregistered up to that point, and since then has never belonged to anyone but me. There were only one or two other Muslim matrimonial and Arab matrimonial services in existence at that time. One was Zafaf.com, which shut down some years later, and the other was Muslim Matrimonial Link, which still exists but looks and functions exactly as it did back in the 90’s, down to the dated backgrounds and hyperlinked list of ads. At the time, I never expected that Zawaj.com would grow the way it has. It was a hobby. I remember that in the beginning, the matchmaking database consisted of simple HTML pages, and I used to hand-code a new HTML page for each new profile. The service was free back then. I changed it to a paid service in 2002 or so, and then a few years later I changed it back to a free service again. Not “free trial” free, or partially free, but completely, 100% free, with revenue generated by advertisements rather than membership fees. I liked the idea of offering something for free that everyone else charges money for. I liked the fact that Zawaj.com attracted thousands of people who could not afford a membership fee, including people from North Africa, Egypt, Arabia, Pakistan, Indonesia and other nations all over the world. But the world runs on certain realities, and one of them is that money makes the wheels turn, or at least makes them turn more smoothly. Over time the Zawaj.com programming grew obsolete and buggy, and I did not have the funds to rebuild it. In the meantime the internet witnessed the rise of the huge corporate-run matrimonial websites like Shaadi.com and Qiran.com. These sites work by virtue of sheer size, but in my opinion they lack a personal touch. You get lost without a rudder in a sea of profiles. You may notice that I have not shied away from mentioning the names of my competitors in this post. That’s because I’m confident that Zawaj.com is now as good as – or better than – anyone of them. Today marks the end of an era for Zawaj.com and the beginning of a new one. We say goodbye to our years-old program and simple HTML home page, and we introduce a new look, a new content management system, and a new matrimonial database. The new database is easy and fun to use, and you will find it brimming with intelligent, attractive, successful men and women ma-sha-Allah. Meanwhile we continue the tradition of offering the internet’s best articles and features about Muslim and Arab weddings, marriage advice, family relationships, and much more. Please note that you can find links to our old Zawaj.com website and content on the right side of the page. With literally thousands of pages of unique content, we are much more than a Muslim matrimonial service. And now you can comment on the articles, share them, and even write your own if you wish. As a way of illustrating the uniqueness of Zawaj.com, in the early years I came across many small websites where people had documented the Muslim wedding customs of certain cultures, complete with detailed descriptions and photos. I sometimes used to reprint those on Zawaj.com with the writer’s permission. Since then many of those websites have shut down, and now Zawaj.com is the only place you will find those unique articles about things like the wedding customs of Muslim Bulgarians, or a photo essay of a Somali wedding, or an insightful article about the role of women in Islam, written by someone who has since disappeared from the scene. I want to extend a heartfelt thank you to all of Zawaj.com’s loyal readers, members and partners over the years. I am confident that this change will benefit everyone – especially you – and I thank Allah for opening the door to this new and exciting road. Eid Mubarak 2012 / 1433 – Happy Eid from Zawaj.com!